New Zealanders are proud of their Kiwis. The bird holds an honorary place in the country's tradition and culture. The love affair with these unusual looking birds began with the Maori people. The Māori believed that this sacred animal was under the protection of the forest god, Tane, and bringing harm to these little ones would incur the god's wrath and result in the destruction of the land. This reverence for the Kiwi is such a strong part of native culture that even the European settlors who later populated New Zealand held these beliefs in high regard and passed on their love for the bird to future generations. The image of the Kiwi is present all across the country and is prominent on military uniforms, bank notes, and various other items. The Kiwi is a symbol of Family and Loyalty. Mating pairs usually stick together for the rest of their lives together. This is a rather unusual trait in the avian kingdom. Sadly, the loss of habitat and the relatively low survival rates of Kiwi chicks push these birds closer towards extinction. Conservation efforts are now underway, but many New Zealanders worry that their efforts may simply be too late to help their beloved friend. In most cases, Kiwi Tattoos tend to have tribal roots, given that the bird's symbolism is strongly linked to an ancient tribe. 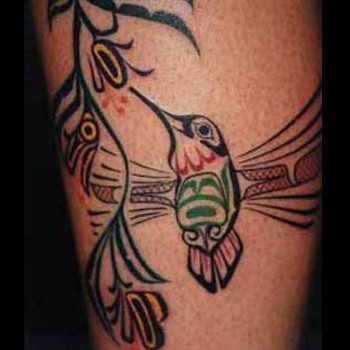 Kiwi Tattoos are usually black and will feature elements that are native to the Māori culture. Showing off your proud heritage as a New Zealander is best done with the quintessential image of the country, the Kiwi. But creating an enchanting design that is symbolic of your deep respect for the Māori tradition can be tricky. There are any number of elements to think of, including the design's placement and purpose. If you need a little help getting the ball rolling, simply take advantage of our Custom Design Service. Our team will be more than happy to help design a truly unique piece for you.